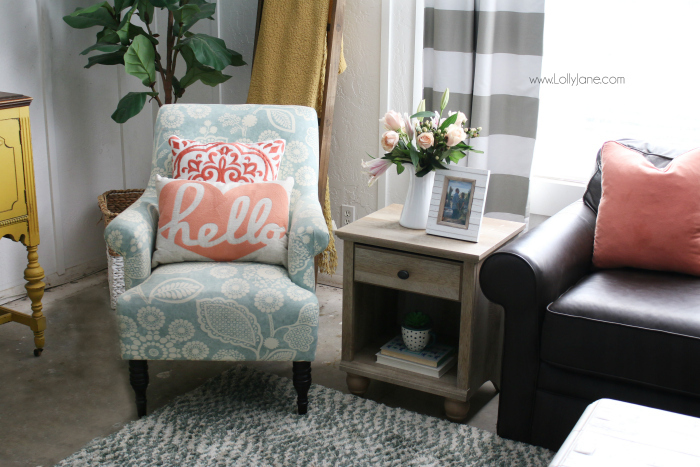 This post is in partnership with Better Homes and Gardens and Walmart. 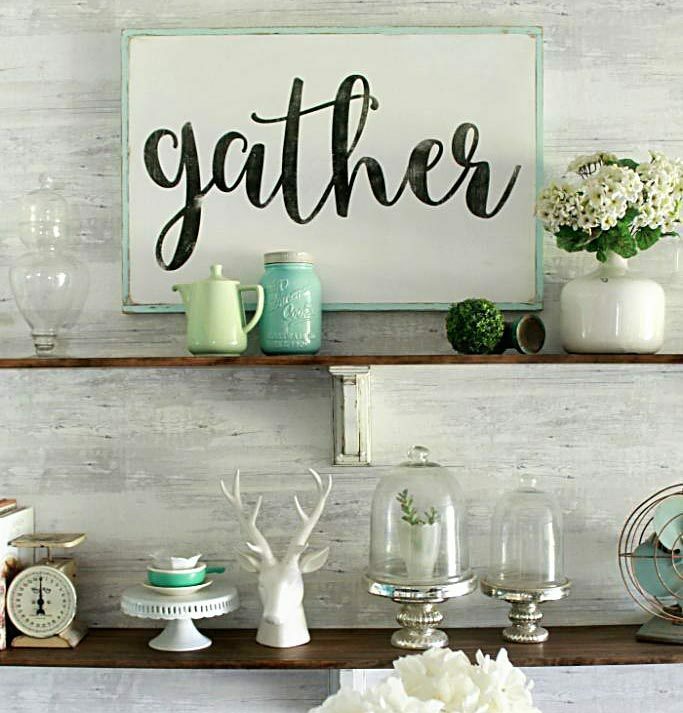 We are proud members of the BHG Live Better Blogger Network. All opinions and ideas, as always, are our very own. ???? This post contains affiliate links to sources we adore! The summer blues are here! Summer blues, you ask? Well yes, it’s 122* outside here in sunny Arizona so while most of the country gets blue in the winter, we’re outdoors riding motorcycles or barbequeing in shorts. You can laugh now! When we’re not in the pool, we’re all squished into the family room watching tv or playing a round of UNO. 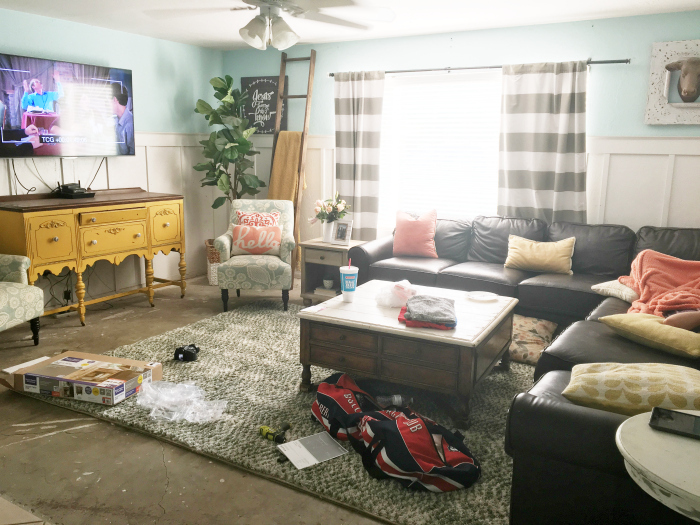 We got new couches the same month our house flooded last year so we ripped out the carpet in our family room and have left it untouched basically. I’ve gone through a series of rugs in that space but that’s about it. 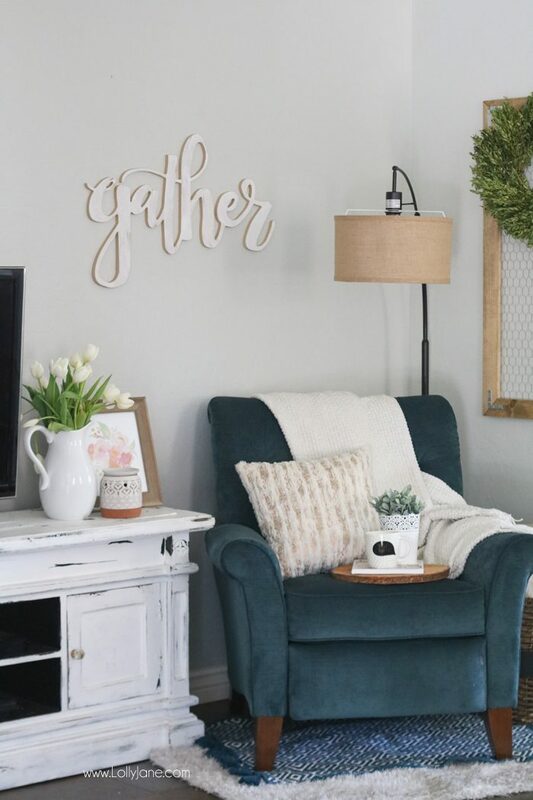 It was time for an indoor shopping excursion so I loaded up my little ladies and they helped me accessorize some pretty and affordable finds at Walmart, shopping the BHG Live Better line. First of all, I was happily surprised to find these gorgeous flowers at Walmart. 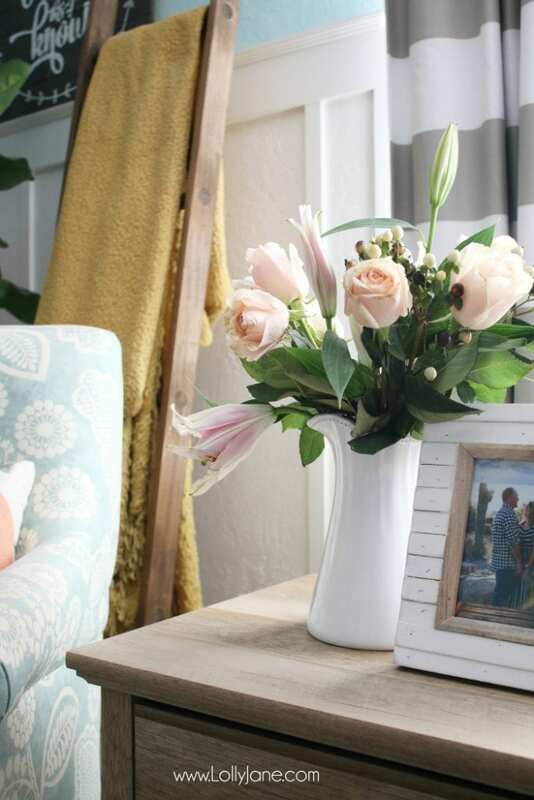 Mixed blooms with fresh greenery is very popular among the farmhouse trends and this unusual mixed bunch of peach roses and lazy lillies compliments this little corner perfectly. 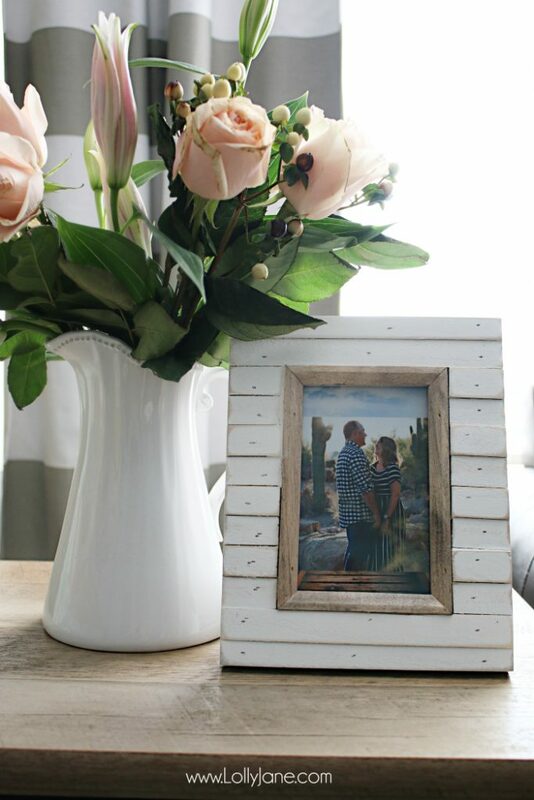 I love this BHG picture frame. 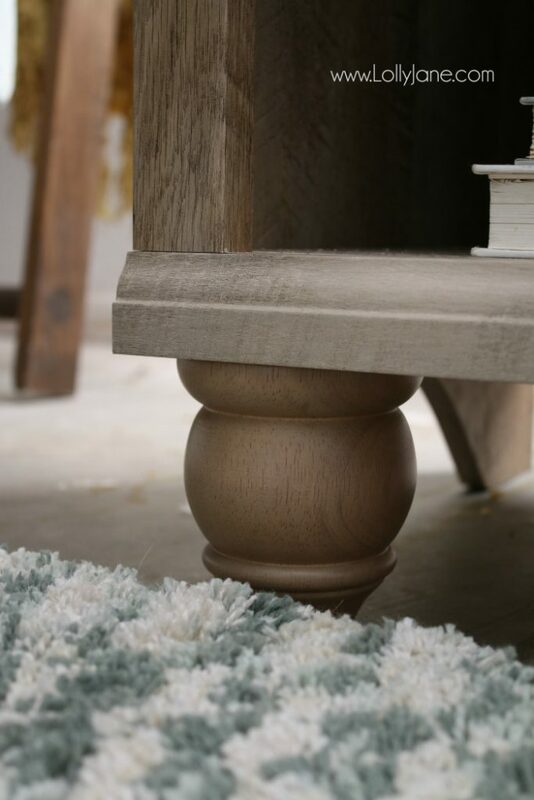 It’s super coastal and looks like mini shiplap! I’ve actually decorated with it before on my master bedroom gallery wall and still love the classic white paired with the stained inner frame. 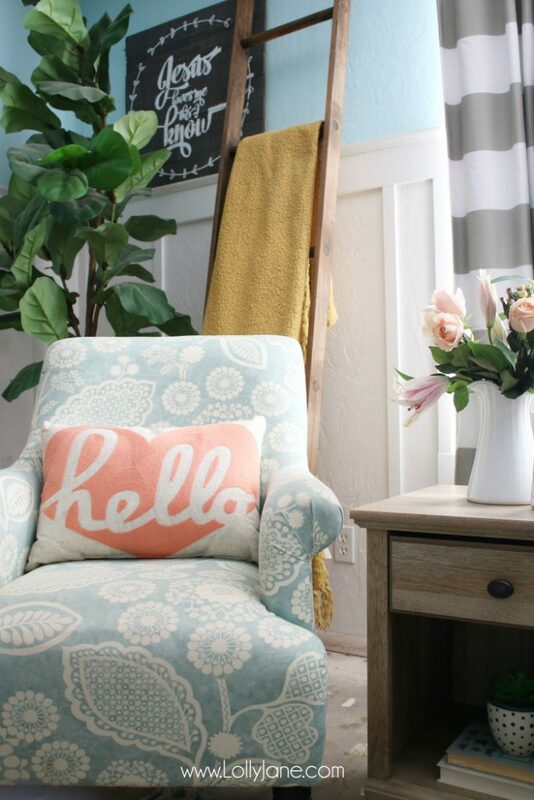 Let’s chat about this coral hello pillow! My 14 year old grabbed it and said, “Mom! This is so you!” She’s totally spot on and this happy statement compliments my love of aqua and mustard perfectly. Our love of succulents runs deep! I guess you can blame it on the fact that we’re native Arizona girls but when I saw this cute concrete succulent in Walmart’s craft section, it jumped right into my cart! 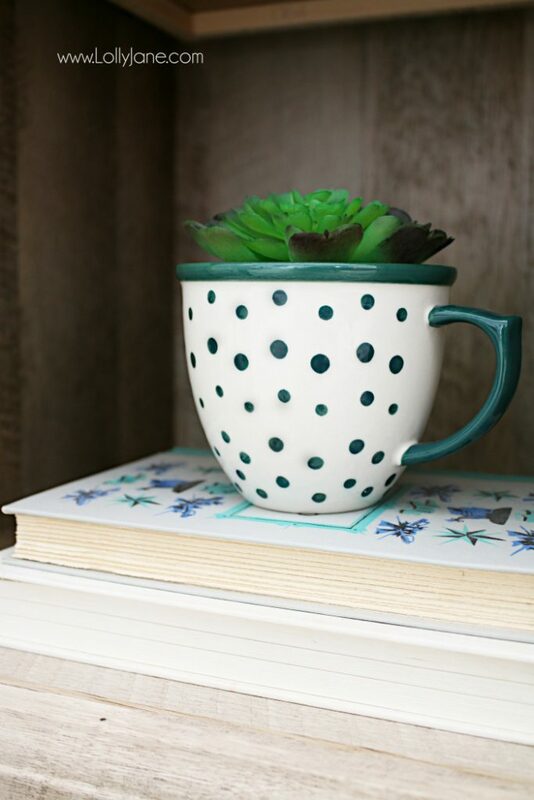 I placed it inside this fun polka dot mug from the kitchen section, it’s so cozy down there inside the stained Crossmill side table. 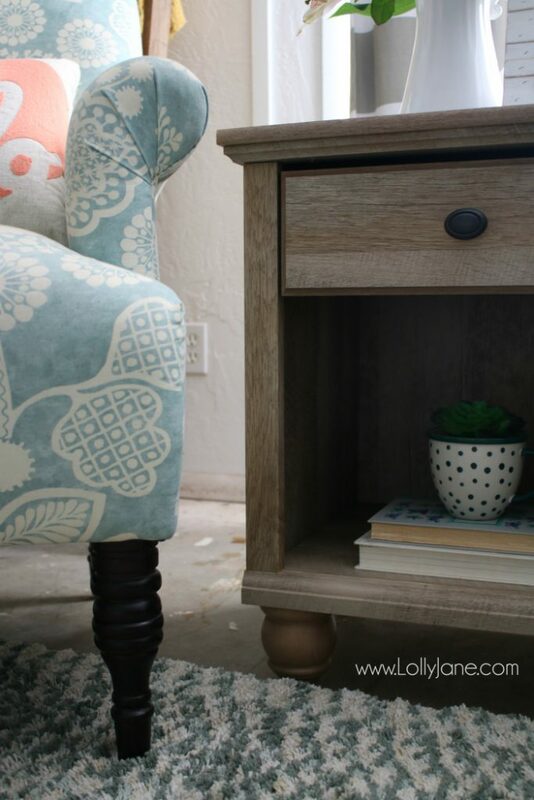 This little side table totally completes my space. 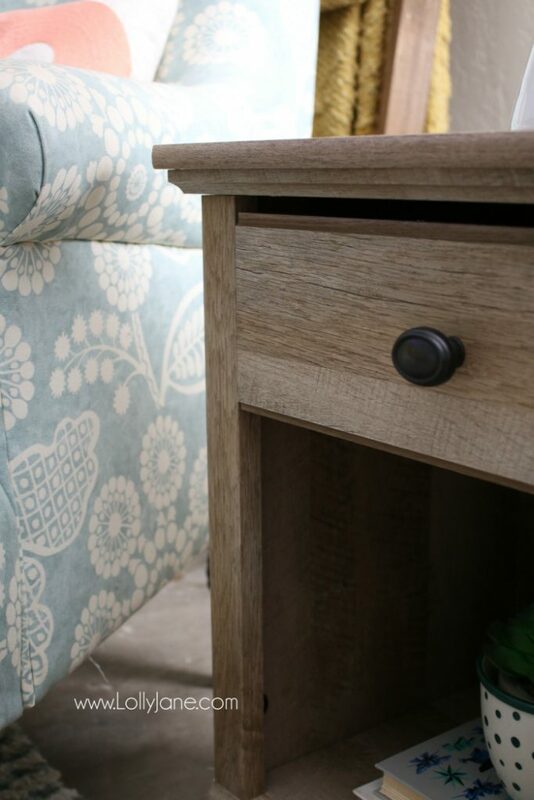 I have a longtime love of color but adding this stained table grounds the corner more, don’t you think? 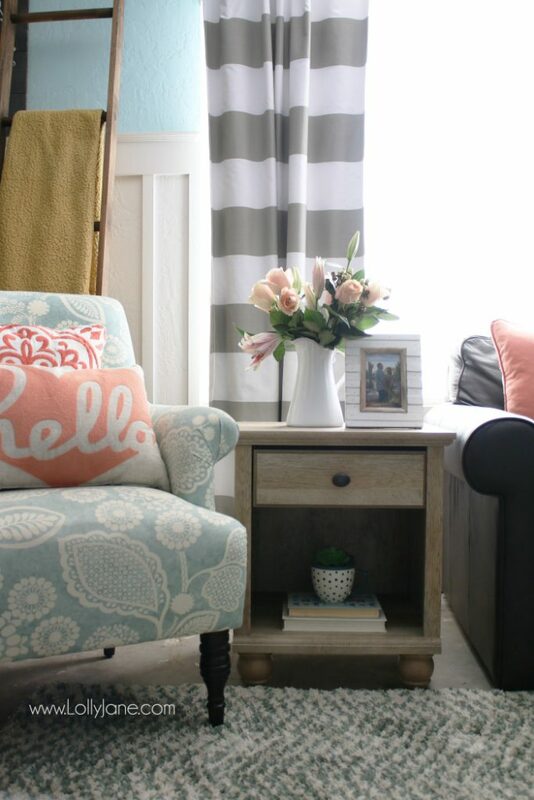 I love how the color pops against it versus blending into my white table I had here before. That little leg is so dang cute. I love that it’s real wood and adore the curves on it. The dark knob is the cherry on top. 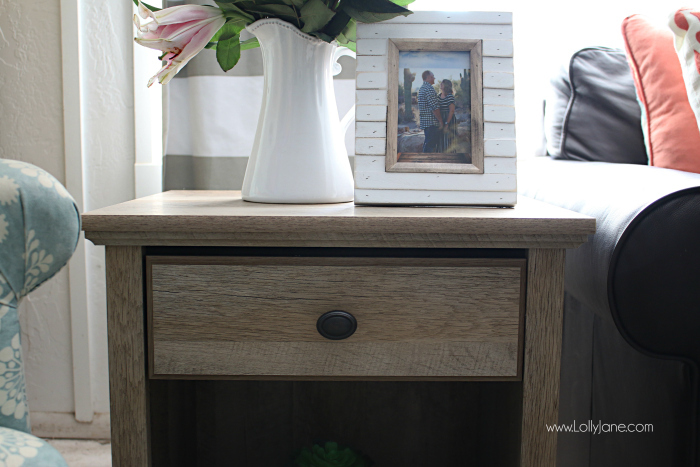 Such a cute little drawer, isn’t it? 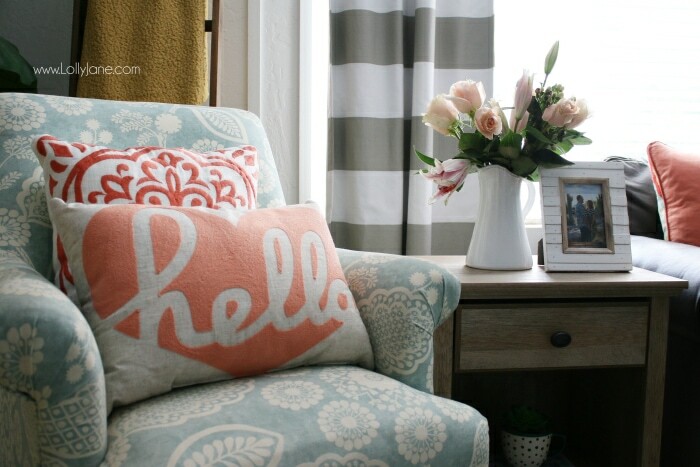 I originally had this embroidered coral and white pillow on the couch but love it paired with hello pillow! 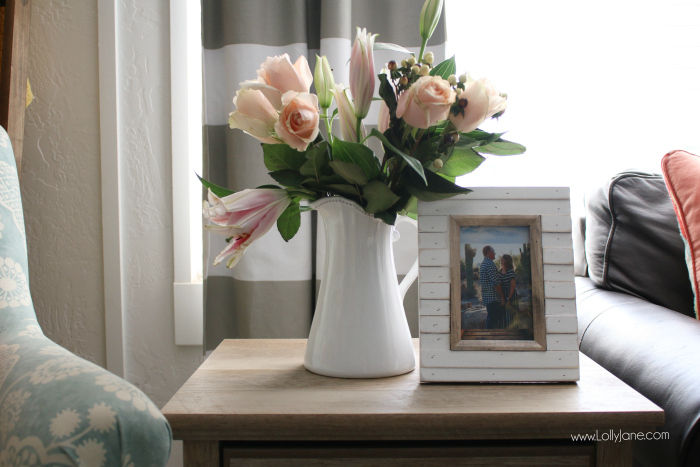 The pillows really pull together the blooms. I really want to be one of those women who visits the farmers market weekly for fresh flowers but let’s be real honest, I’m not her. 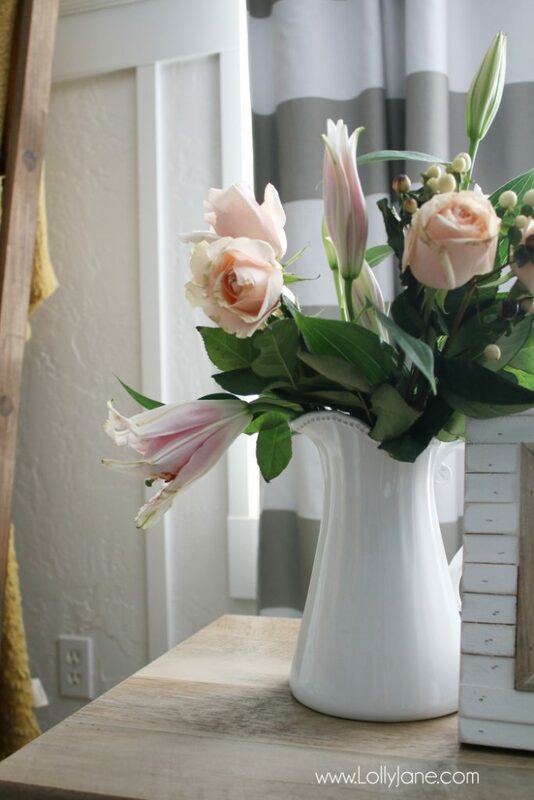 Walmart and fresh flowers are perfect for the Kelli’s of the world and for that, I’m grateful to have one just up the street! 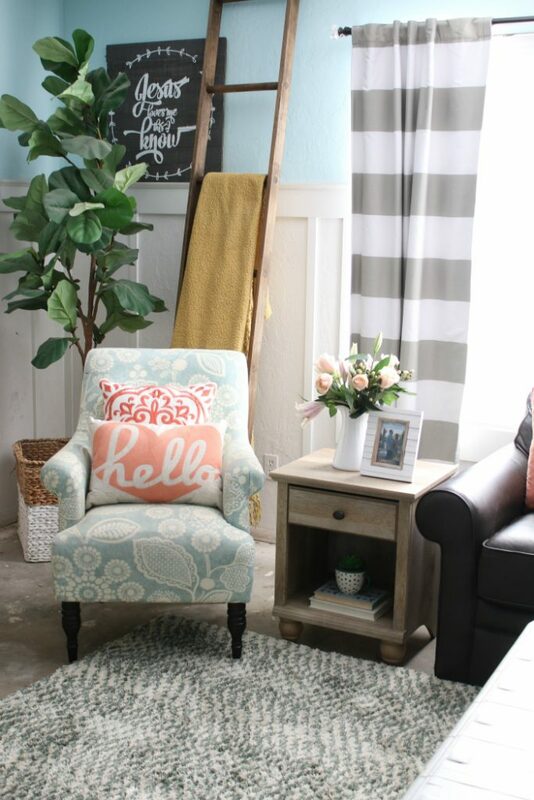 And while we’re talking about being real…here is what the rest of that room looks like 😉 I don’t want to be someone who pretends to have it all together. This summer has really kicked my trash with my grandfather dying next door (in my mom’s home with in-home hospice) and as a result, the kids being at each other’s throats because our mom needed so support. It’s okay to let the mess take over once in awhile. 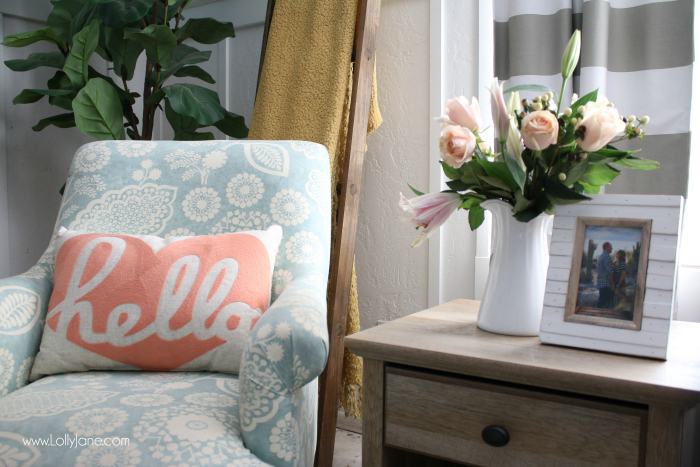 It’s okay to admit we’re not perfect but it’s also okay to spruce up a corner and feel good. And that’s what this corner did for me…it allowed me to take my daughters shopping with some girl time, picking out happy pieces of accessories together and ending the trip with a visit to our favorite soda shop. Here’s to being real and being real happy about real prices. 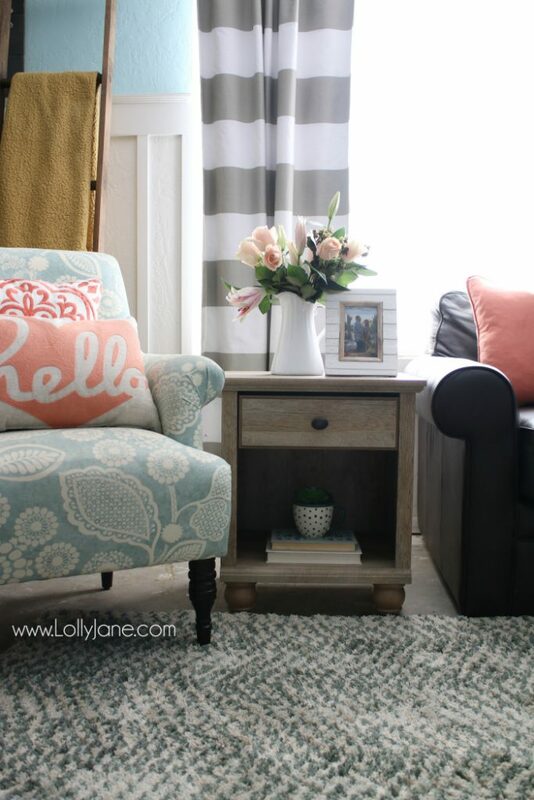 We’re super grateful for the opportunity to work with Walmart and share BHG’s Live Better line. We’re not the type of gals who shop expensive boutique type stores, it’s not affordable and it’s not who we are . We’re glad to be able to have trendy options down the street. 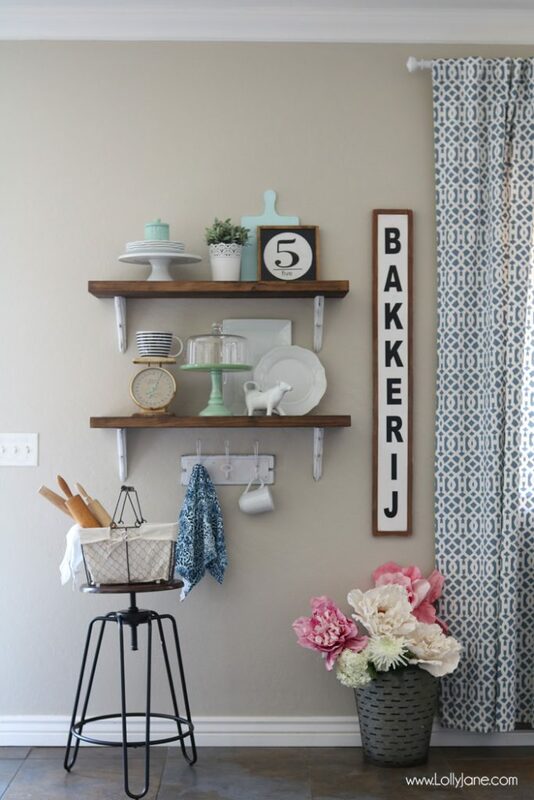 So thank you, BHG and Walmart for giving us so many cute options! 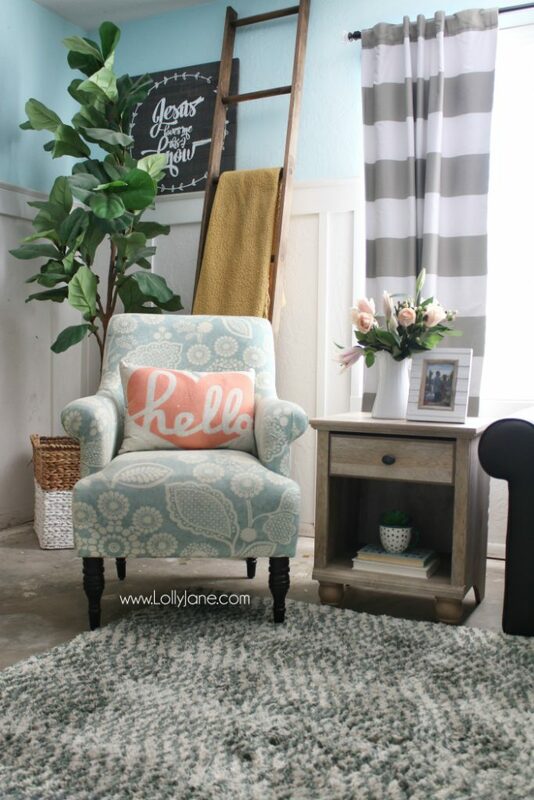 and our Cozy Family Room Reading Nook! This is such a pretty and happy space! Coral is always a good color for that! Sorry to hear about your grandfather. I think it’s great that you are able to be there for him and for your mom. These days will become treasured memories…even though they are a bit tough right now. Where did you get the chair that your hello pillow sits on??????? It’s wonderful. But what I really need to know…WHERE did you get that chair? It’s perfect. Thank you for showing your “real” life! And hey, aqua (or turquoise) and mustard – that’s mah jam. I have an armoire that I’ve some mustard-y chalk paint for, but haven’t painted it yet. Spying that mustard in your room seals it. So pretty! 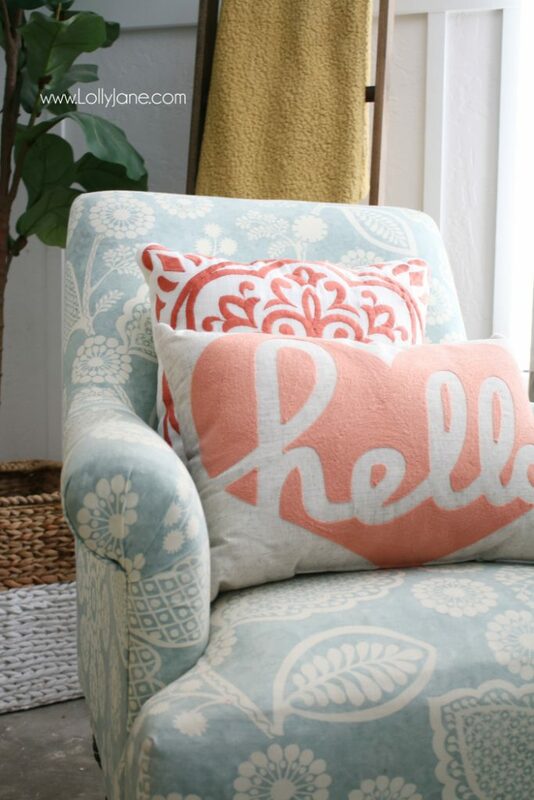 I love the color combinations and that pillow is perfect! This post proves you don’t need to be rich to have tasteful decor. Its so pretty. I like that you showed the chaos part as well. I just finished the back deck and half way through doing the patio and a craft room. AND the guys are coming to finally redo a badly scratched hardwood floors. Our home is chaos. My condolenses xo. I love it all. Do what you can with what you cannot it will all bring you joy. You certainly have had your struggles but you have been real and practical. You are a wonderful model for your girls. Beautiful! I decorate too with what I can. I love your curtains, could you tell me where you bought them? Thanks so much?